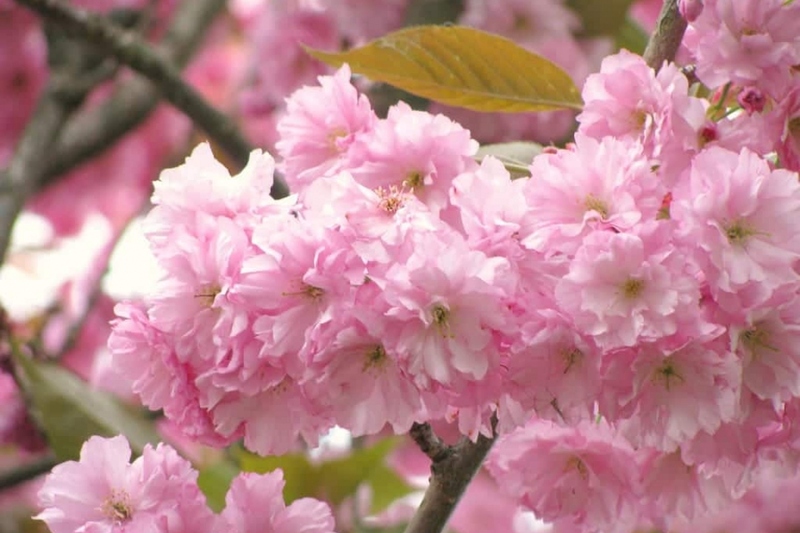 Japanese Cherry (Prunus serrulata): growing, planting, caring. An early blossom display of pink flowers. Prunus serrulata - the Japanese cherry - is a species of the rose family Rosaceae native to China, Japan, and Korea, and widely used for its spring cherry blossom displays. It is a small deciduous tree with a short single trunk reaching a height of 26–39 feet (7.9–11.9 m) with alternate, simple, ovate-lanceolate, 5–13 cm long leaves with a short petiole and a serrate or doubly serrate margin. At the end of autumn, the green leaves turn a beautiful yellow, red or crimson. White to pin flowers are produced in racemose clusters of two to five together in spring when or before the new leaves appear. Plant preferably several cherry trees, for pollination, in ordinary soil (especially not heavy and wet), in the sun. In the open ground: Planting in bare roots is done only in winter, while you can plant the trees in mound and container until spring. In bare root, shorten the roots, and soak them in a mixture of earth and compost. Plant in a hole at least 20 cm larger than the root ball, gradually putting the crumbled soil back, and tamp regularly around the roots. Water just after planting in a hollow formed around the trunk. Water after planting with at least 50 liters of water that you will pour into a basin formed around the trunk. A tilted stake planted in the hole will be useful against strong winds as long as you don't forget to remove it after 2 year and that you use a supple attachment. In pots: Plant your cherry tree preferably in autumn, and possibly in spring. Find a big pot - equivalent to the volume of the foliage. Lay a layer of gravel on the bottom, then fill until the third of the container with loam and potting soil. Arrange the rootball, then add the same mixture of earth and potting mix until it reaches water. Water gradually.